Dundalk boss Vinny Perth has opened up on his disappointment at not being part of the package when Stephen Kenny left the League of Ireland champions to take his new post with Ireland. The long serving Dundalk assistant has admitted that he was excited by speculation linking Kenny with the national team coach because he thought it might give him the opportunity to become involved with the international team. 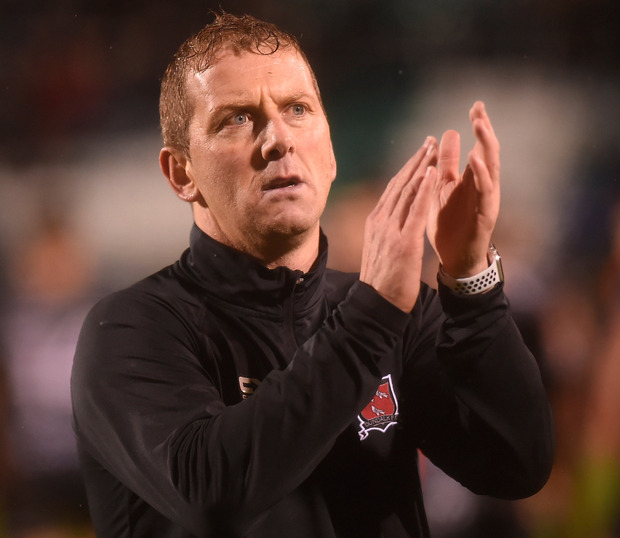 He also believed that his input was vital in the success that Dundalk enjoyed under Kenny. However, on the day that Kenny accepted the Irish U21 job with an agreement to take over as senior boss, he arranged a meeting with his number two where it became clear that the manager was leaving on his own. The blow was softened for Perth by a call from America to say that Dundalk viewed him as central to their plans going forward - and that ultimately led to his appointment as head coach. But he was still disappointed by how it ended with Kenny, although he told Off The Ball that they still have a good relationship. "I'd be lying if I didn't say that I hoped Stephen got the job ahead of Mick (McCarthy) because of my connection," said Perth. "I felt it was the right time for him to become manager. I still do. It was a strange couple of days. "Naturally I would have been disappointed at the time because I would have had the same ambitions as Stephen. "I'd never be presumptuous. I felt - and probably still feel - that we were a very good team together. I think Stephen is a brilliant manager. I certainly would say what I brought to him helped him be a brilliant manager. "What he brought to me helped me be a brilliant coach. I believe we were a very good team together. But it was clear very early in that meeting that it wasn't going to happen for various reasons. I knew where I stood very quickly. "In my position, I feel that over those last five or six seasons, I would have played a certain role in terms of Dundalk's success. Stephen has got the job off the back of Dundalk's success. I felt I had done enough to be part of that next move as well. "It would have cost the FAI a bit of money to get me out of my contract. I understood the situation. For me, I moved on very quickly. "But when there was talk of Stephen becoming the next manager, I dreamt of becoming the next...I probably wouldn't have got the assistant manager's role, that would have been somebody with a bigger name...but I did have visions of standing at a European Championships. I did have visions of going to a World Cup with him. I'd be telling lies if I said that wasn't what I thought of."